Laurie originally worked as an engineer for 25 years before a life-changing event occurred that resulted in her leaving engineering – her oldest son, US Army Sgt. W. Eric Rodman, left to serve in the Iraq War. After nearly six months of silence, she finally heard from him and he asked her to make him and the men in his unit ‘some quilt things’ so they could use them at night. She, along with a few other women from a Savannah, GA quilt guild, made 39 quilts for the 101st Airborne’s 2nd Cavalry Unit just before Christmas in 2003. The idea to start a business making high quality ready-made binding came to her as she listened to her fellow quilters complain about the time consuming task of making bias binding. The engineer in her saw the possibility of making a unique new product, the Lollipop. The rest is history! Since those first quilts were made, Sgt. Rodman has served two additional tours of duty in Iraq, and each time Laurie and her quilting friends (many of whom have had active duty husbands, sons, daughters and dads) have made quilts for her son’s unit, to honor their service. After many years of travelling to quilt shows around the world and teaching her methods, Laurie and her sister, Mary Davis, fulfilled a life long dream of opening a business together - and in 2013 opened Lollipops Quilt Shop in beautiful Amelia Island, FL. 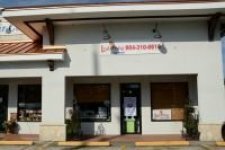 We are a friendly, modern style shop that offers quick tools and techniques to beginners as well as experienced quilters alike. It is our joy to see beautiful quilts come from our helping our customers create magic with a sewing machine and fabrics from every major design house. Come see us and we'll help you, too!